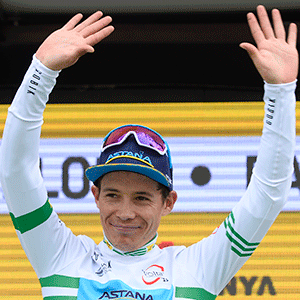 Barcelona - Colombian Miguel Angel Lopez of the Astana team withstood a late attack by British brothers Adam and Simon Yates to claim victory in the Tour of Catalonia on Sunday. Lopez seized control of the Tour on Thursday's summit-finish and the 25-year-old added to the Tour of Colombia he won in impressive fashion in February. "I'm tired but very happy," the climb specialist said in an Instagram post alongside a photo of him smiling broadly on the team bus. The day's racing was marred by a heavy crash of around 20 riders on an 70km/h downhill section. The great French hope Romain Bardet, who appeared to break a collarbone, Simon Geschke and Gari Bravo were all taken to hospital for treatment. Marc Soler also pulled out of the race. "It was a violent fall because we were going downhill fast," explained Bardet. "I'm suffering with my ribs but it could have been much worse," said the 28-year-old Frenchman whose -Tony Gallopin also went over his handlebars. "We had quite a fright," said team boss Stephane Goubert, who watched his two top riders take a battering. The seventh and final stage, a hilly 143km ride that started and ended in Barcelona, culminating in seven laps of the coastal city and its steep climb to Montjuic. Lopez started the day with a slender 14sec lead over Mitchelton-Scott rider Adam Yates, who, accompanied by his brother Simon, the Vuelta a Espana winner, attempted a late attack but could not break Lopez. Eventually, a reduced group of 13 contenders all finished about 55sec behind the solo winner Bora-Hansgrohe rider Davide Formolo of Italy. Yates' runner-up spot follows on the heels of his gut-wrenching second place, by a single second to Primo Roglic, at the Tirreno Adriatico two weeks ago. After Chris Froome fell early in the Tour, Sky made the 22-year-old Colombian Egan Bernal team leader and the all-rounder finished third. Top Colombian climber Nairo Quintana of Movistar finished fourth. Defending champion Alejandro Valverde ended 10th.